Jason Alberts is an audio engineer with an extensive career in post-production, along with location sound. His recent work includes mixing on Paralytic, Dead Body, and Soaked in Bleach (film review here). Jason is an engineer at Sumosound in Seattle, WA and was generous in answering a few questions for us before he embarks on his next production. BJ Rochinich: How has it benefitted you to work on both the field recording end as well as the post-production processes? Jason Alberts: Having experience on both sides of the audio workflow has been a huge benefit. On the production side, it’s extremely important to understand how dialogue needs to be recorded to deliver the post team what they need to cut a scene. This often means requesting off camera lines and movements to be stopped. It can also mean requesting on camera moves and noises be mimed so they don’t step on the dialogue. Having an idea of what will, or won’t be easier to add in post really helps. These are the things that sometimes even an experienced director or AD won’t be aware of. They have plenty of other issues to give attention to on set. So when I see, or hear a potential problem, I’ll present it to them and we’ll figure out a plan to get the post team what they want, while also capturing the emotion the director is looking for. On the post side, it’s a huge timesaver to have a good idea of a sound mixers workflow. During a dialogue edit, I feel like I can track down alt takes, room tone, etc a bit faster since I can often picture how the mixer was working. BJ Rochinich: Looking back, what are some key things you did that made you a better mixer? Jason Alberts: I’m kind of an all or nothing type person, so when I made the decision to start working in audio production I really went for it. I researched all the post houses in Seattle and did what I could to get my foot in the door at the one I thought was doing the best work. Audio for picture is such a niche thing that if you show a passion for it, most experienced engineers will appreciate the interest and give some invaluable training and/or advice. I still fall back on some of the early tips I got during my intern days. BJ Rochinich: How has working in audio production affected how you watch or critique a film or TV show? Jason Alberts: Great question! The main reason I wanted to get into sound for picture is my love of film. I’m a bit of a fanatic. The momentary escape a film can provide is such a unique experience. Fortunately, I’m still able to get lost in a good film or show without having to pick apart the audio. Interesting audio elements will stand out to me here and there, and I might store them for later, but if the story’s good I’m watching like everyone else by about 10 minutes in. That being said, if there are issues with the mix, I can\'t get past them. But most people can’t. That\'s why sound is the most important aspect of a film. Across the board I encourage people to always rewatch a film with commentary especially when you can listen to a director or cinematographer or composer. 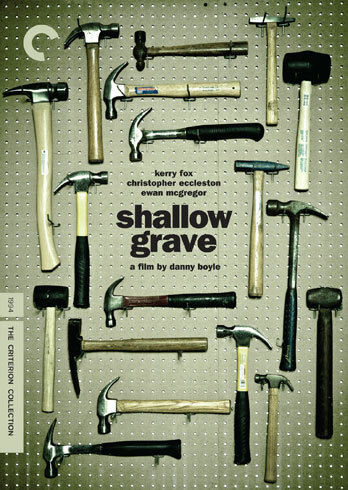 Danny Boyle’s commentary track is certainly enjoyable as he muses about filming, discusses the intensity of lighting, and provides backstories on inspirations for elements of Shallow Grave. What I really love about this film, like The Long, Good Friday, is the cultural influence on the film. This film acts as a bit of a time capsule regarding roommate flat-life in Edinburgh in the early 1990s. 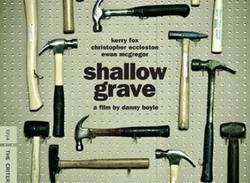 Shallow Grave is fun. It tells a story and though there is an unsettling or unfamiliar feeling at the end (versus the typical wrap-up or comfortable emotional resolution), it’s consistent with a movie that sidesteps typical film trope. If you have seen Housebound it is very similar; it feels familiar but unique at the same time. Grave is a clearly illustrated story of a group of flatmates and a problem. There are no confusing elements in the story itself nor in its assembly. The story naturally evolves as new conflicts occur or as character reveals and actions pave the road for said conflicts. Perhaps you have seen a lot of films that are ambitious but not particularly enjoyable because they become undone in their desire to be unfamiliar and shocking. Attempts to preserve a theme amidst such conditions can be futile but Grave engages the viewer throughout the film by sticking to a clear story with surprises that are almost rational or at least that avoid convoluting the story. The characters’ nuances and differences are their developmental arcs for the most part: it’s as though you are a flat-mate watching the events unfold. The cast is quite enjoyable and their chemistry and angst is an essential element of telling this story. Danny Boyle’s comments regarding how these characters were influenced by the era is incredibly educational and shows an intended level of awareness for the film. I appreciated the depth and slow camera movements with consideration to time and space. The few tense, faster moments of the film are amplified by the film elements at work in the longer, more expositional chunks of the movie. As I watched Grave I could feel that I had been missing out on visual pace and certain of camera work in what I have watched as of late. The score is peppered throughout the film and reminded me of some of Goblin’s work in Suspiria. Like that score, Simon Boswell’s work gives the film a haunting tone. Boswell’s score effectively works as a valuable element to setting the scenes and advancing the story by affecting the tone. I feel like I go back to Halloween when referencing scores, but it’s true that taking that a storyteller’s approach with a score gives viewers a magnificent experience. The story of the conflict that besieges these characters is crafted with minimal but seemingly spot-on strokes. It’s a visual experience. The supporting characters are not particularly, on paper, well developed but they are memorable. It’s the bold colors, the big objects, the specific scenery and the grisly story that provide the landscape for these supporting story-characters to exist with significance in an otherwise underdeveloped manner. It’s wonderfully well-crafted and everything is provided for the viewer to enjoy a film that has real feel to it; not a “real feel,” but a feeling of life. However the ending may sit with the viewer, it is precisely the most appropriate culmination for this viewing experience and completes this film. Posted on Sept. 6, 2015, 4:55 p.m.
Posted by BJ Rochinich on Sept. 6, 2015, 4:55 p.m.